I can't help it. Juliet Marillier has a new book coming out and I start experiencing all the feelings. The fact that this one is the first in a brand new adult fantasy series just ratchets it all up. I've read and enjoyed her YA offerings, but I discovered her through Daughter of the Forest, and so at heart (for me) it will always be about her beautiful adult fantasy novels. I love this cover so because it reminds me of Trina Schart Hyman's work, which I adore. 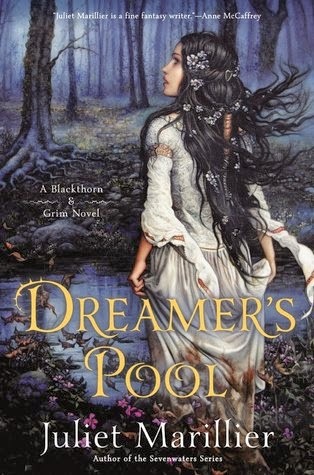 Due out November 4th, Dreamer's Pool is the first in the Blackthorn & Grim series. Set in medieval Ireland, it follows two main characters who Marillier describes as "older, more flawed protagonists." Good heavens, bring it to me now. That cover is gorgeous! I seem to have a soft spot for flowing tendrils of hair and this has that. Lol. I have the same weakness. And this one just seems to fit her style of story so well. Such a beautiful cover! I wonder who the cover artist is. i can't wait for this one. Cannot. Wait. So do I! I'd love to see more of her/his work. Me, too! Back to Ireland but wholly unrelated to her other series. I love the sound of these two characters. I think I might want to live inside that cover because . . . wow. How long of a paper chain do I have to make for November? Right? Lol. Let's string one up at work! It comes out on the same day as the new Sharon Shinn book (the third of that shapeshifter series). Too much goodness in one day!! Let's hope nothing stressful will happen during that week. Ahh. Those two have been on the same release cycle for some time now and it is like all the presents wrapped into one heady day. Cannot wait. I haven't read that yet! Let me know what you think of it. I have a good feeling about this one. I just do.